I’ve always thought of Geralt of Rivia as a big ol’ cat. I know they call him The White Wolf, but come on: the guy is a cat. So it’s been bumming me out that after a recent patch to the game, all the cats in the Northern Realms seem to hate the guy even more than they already did. I have unfortunately deleted a lot of my archived Witcher 3 footage, but I feel pretty confident that it didn’t used to be that bad. I’m not the only one who noticed—this summer, several threads cropped up with other players asking why the cats so consistently hiss at our favorite Witcher these days. 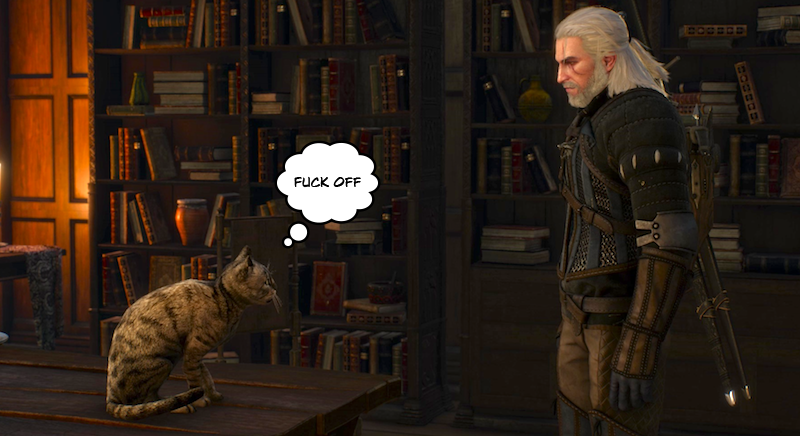 The cats’ hatred is accurate from a lore standpoint—characters in the Witcher books have noted feline distaste for Witchers, for instance. Many players have also wondered and theorized about why Geralt keeps running into a particular cat—Nibbles, seen in the videothumb above. I’m not sure I’d necessarily call the change in cat behavior a “bug,” though the consistency with which the cats do the same reared hissing animation does seem a bit odd. Intentional or no, it’s bumming me out.